Perhaps your doctor recently suggested that you get a humidifier for your home to help ease the sinus pressure you’ve been suffering with. Or maybe a coworker bragged about all the benefits they get from the extra humidity their house has with their brand-new cool mist humidifier. You’ve been weighing your options, but you might not know where to look for the best cooling mist humidifier. There are all sorts of factors you should consider first and one of the best places to start is right here. You can read about the features that are absolute must haves. 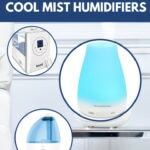 Is a cool mist humidifier a better option than a warm mist one? Or would you benefit from one being in a southern state where the humidity seems to be about 110 percent in the middle of summer? What if You Already Live in a Humid Climate?